Sautéed collard greens are an easy and delicious weeknight side dish. This simple recipe is ready in under 15 minutes! Let’s start by getting one thing out of the way about this dish. 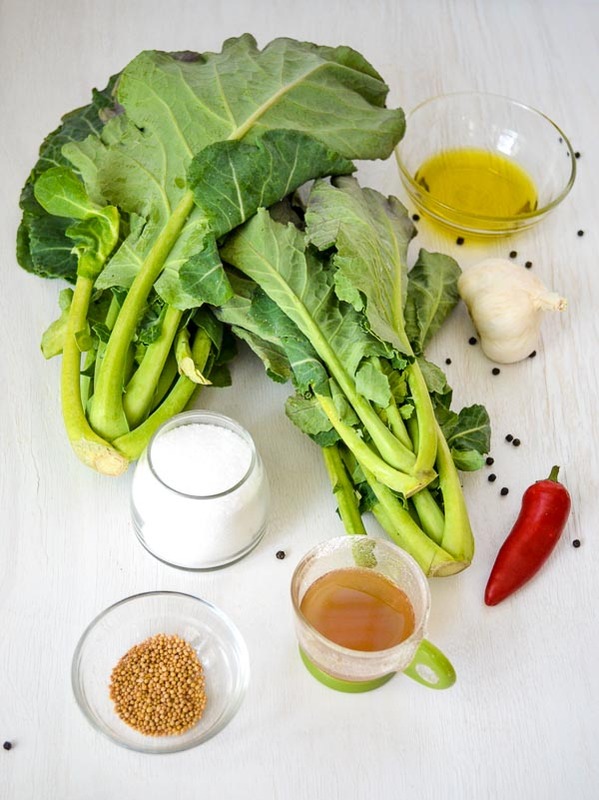 This collard green recipe is nothing like the traditional boiled collard greens you see across much of the Southern United States. 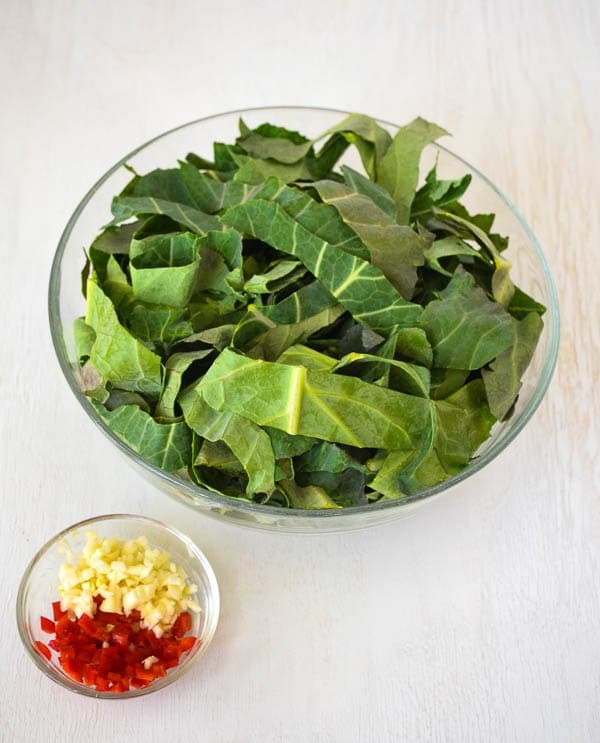 Boiled collard greens take much longer to cook and are traditionally cooked with meat. These sautéed collard greens come together much quicker for an easy vegetarian side dish. The lengthiest step in this recipe is rinsing and drying the collard leaves! If you’re truly pressed for time, prep the greens earlier in the day and store loose until ready to cook. The key factor that makes this recipe shine is using fresh ingredients. 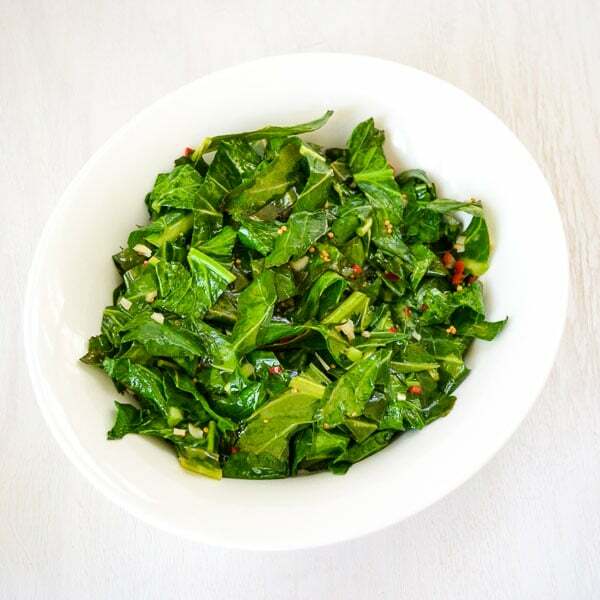 It only takes a few minutes to chop the fresh garlic, collards and pepper. You will not regret the extra few minutes! The inclusion of a red chili pepper adds the right amount of heat to cut the bitter greens and the addition of cider vinegar will neutralize the spice. First, rinse and dry two small bunches of collards. Traditional grocery stores usually sell two bunches of greens as one unit. Next, cut the stems off the bottom of each leave. Stack the leaves largest to smallest and roll tightly. Hold one end of the roll and slice the collards from the opposite end into 1/2-inch ribbons. Set greens aside. Next, trim stem off red chili pepper and slice the pepper in half lengthwise. Remove pepper membrane and seeds. Finely chop pepper and set aside. Prep Tip: Wear gloves when handling spicy peppers. It’s possible to inadvertently transfer the capsaicin (the active ingredient in chili peppers) to your eyes or lips. Warning: It burns! Peel and mince two to three garlic cloves (dependent on size). Use two large or three small cloves for this recipe. Next, heat the oil in a wok or large skillet over medium heat. Add the chopped pepper, garlic and mustard seeds to the hot oil. Sauté mixture for approximately two minutes or until garlic is golden. Next, add the collard leaves to the pan and toss thoroughly with oil mixture to coat leaves. Kitchen Tool Tip: Tongs work well for this step! Finally, sprinkle the collard greens with several pinches of kosher salt. Add the cider vinegar and sauté for one more minute. 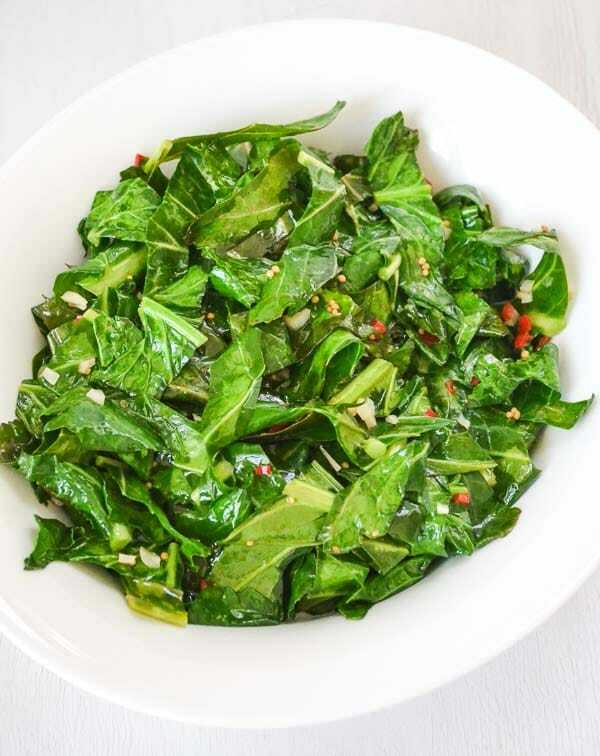 Remove sautéed collard greens from heat and serve! Feel free to adjust serving amounts in recipe card to prepare more or less depending on your party size. 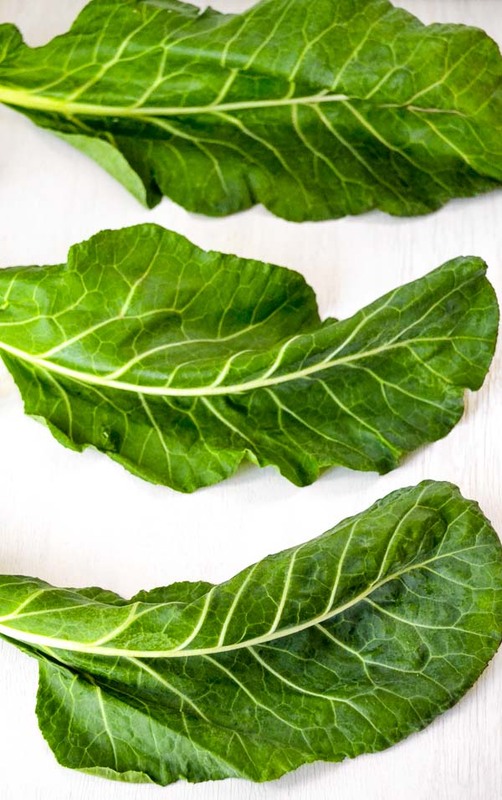 These sautéed collard greens are naturally gluten-free and meet vegetarian and vegan guidelines. Adaptations for Kids: Omit hot pepper for most children. 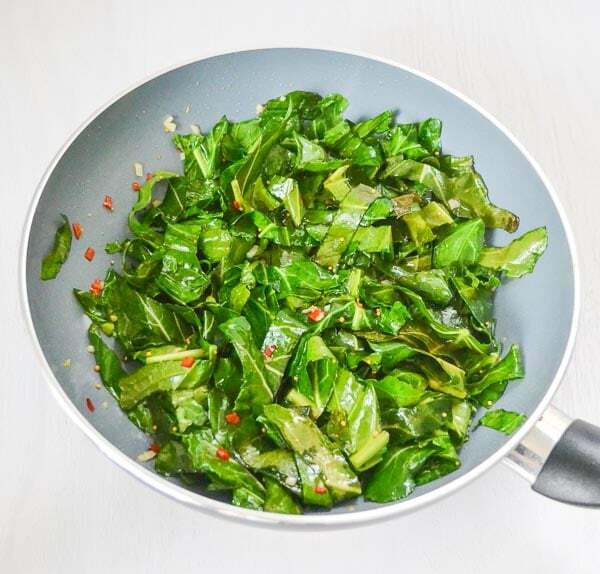 Meal Idea: These sautéed collard greens are delicious alongside Southern Skillet Cornbread and a lean protein. 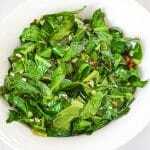 Please let me know if you try my Sautéed Collard Greens by leaving a rating and comment. Rinse the collard leaves and dry thoroughly. Cut stems. Stack the collard leaves together, roll and slice into 1/2-inch ribbons. Cut stem off chili pepper. Slice in half lengthwise. Remove membrane and seeds. Peel and mince garlic. Heat the oil in a large skillet or wok over medium heat. 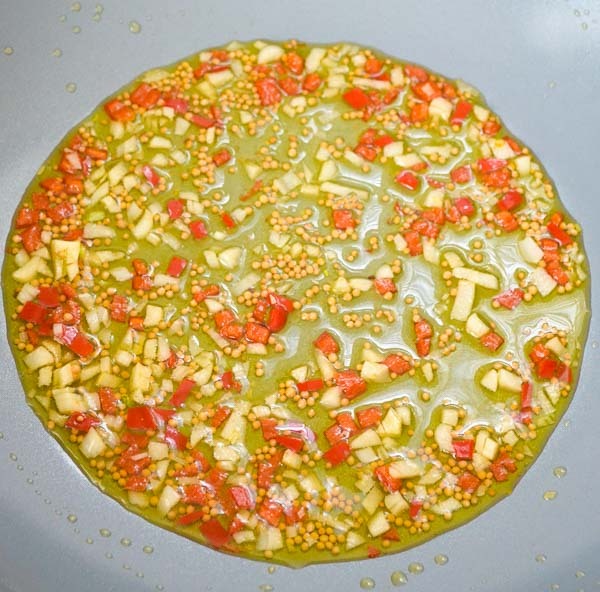 Add the chopped pepper, minced garlic and mustard seeds to the oil. Sauté (stirring occasionally) for approximately two minutes or until golden. Add the collard leaves to the pan and toss to coat leaves with the hot oil mixture. Sauté for approximately 2-3 minutes. Add salt and vinegar and cook for one minute. Serve immediately. This recipe calls for 6 cups chopped greens, which is approximately two small bunches of collards. The chili pepper is optional and can be reduced if needed. 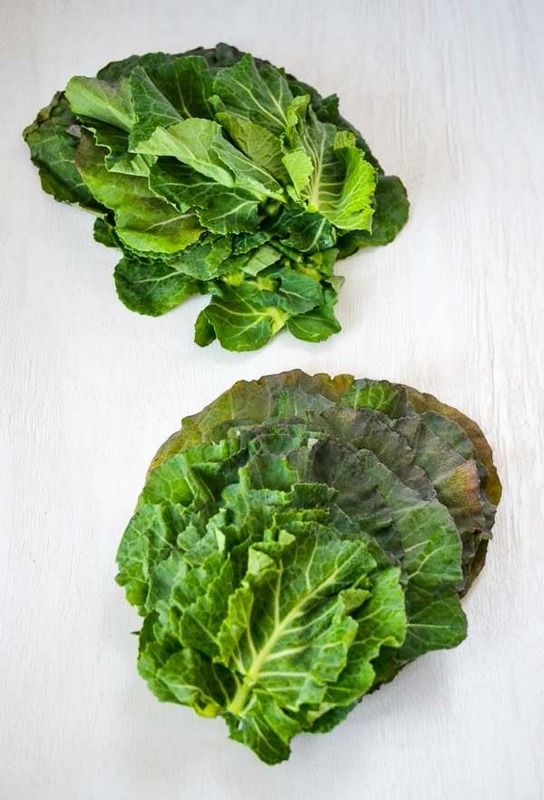 Looks like a healthy alternative to traditional Southern collards! Definitely healthy and so good! This was so good !! I’m glad you liked the greens! This is one you will definitely enjoy; careful with the spice for your taste! Good old Southern favorite modernized!